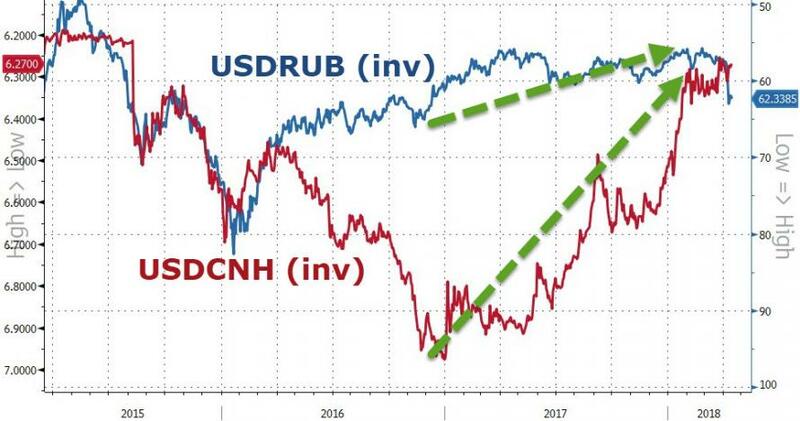 Yesterday morning, Trump raised may eyebrows with his tweet accusing China and Russia of "unacceptable" currency devaluation: after all it was Trump's own policies that sent the ruble reeling in the past month, while the Chinese yuan was as its highest against the dollar since the August 2015 devaluation. Trump’s confusing Monday FX-related tweet emphasized his desire for a weak dollar. He’s likely to get his wish in the long run, even if he’s already seen more greenback depreciation than growth and interest rates would have warranted in isolation. The yuan has climbed 9.5% against the dollar in the past year. The ruble has fallen 7.5% versus the dollar this month, but only because of U.S. sanctions. Despite that violent Trump-prompted correction, Russia’s currency has still gained versus the dollar since he won the presidential election in November 2016. The fact that his tweet jars with reality underscores his determination that the dollar needs to be weaker for trade purposes. Trump is the one who’s successfully playing the “devaluation game” -- the Bloomberg Dollar Spot Index has fallen more than 10% since he came to power. He mentions interest rates but, on a total-return basis, the dollar has been the worst-performing currency in the world since his inauguration. This has happened despite improving U.S. growth and much higher real yields. Economic fundamentals suggest that dollar depreciation has been excessively rapid and 2018 may yet see a powerful bounce. It’ll only be a bounce though and nothing more -- the long-term downward trend in the dollar is sustainable as its global dominance is slowly being eroded. The U.S. accounts for less than 25% of the global economy and that number will be in steady decline amid the rapid growth of China and India. And yet the dollar still takes up almost 63% of global FX reserves. That mismatch will gradually narrow over time. 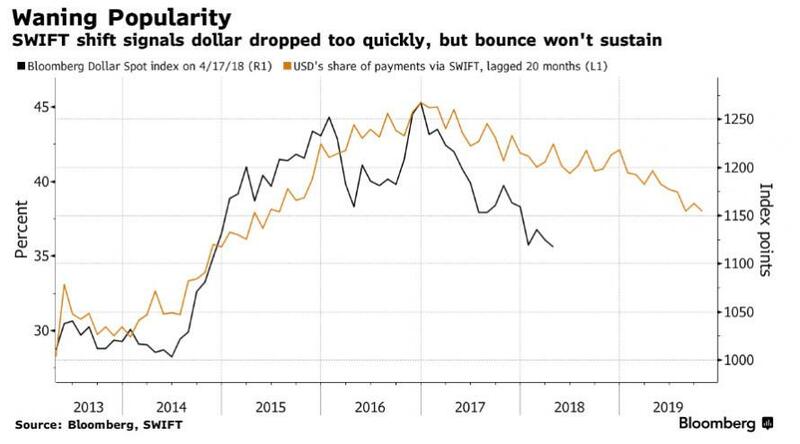 It turns out the dollar’s share of global Swift payments has provided an excellent guide for this theme over the past five years, with roughly a 20-month lead. The dollar’s percentage of global Swift payments started climbing rapidly from a 31% share in November 2012. The Bloomberg Dollar Spot Index commenced its own rapid ascent 19 months later. Dollar dominance peaked at more than 45% of Swift payments in April 2015 and has been trending lower since. It’s now back to 38%. The BBDXY topped out exactly 20 months later. The message from the Swift data is clear. The world is trying to wean itself off the dollar. Trump’s impressive start in the “Currency Devaluation” game may be a precursor to long- term victory even if there are setbacks along the way.